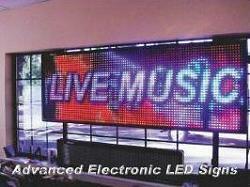 These Electronic LED Sign displays are the latest in truly affordable electronic messaging centers. Add colorful and dynamic presence to your business. Our displays store multiple messages. Program your messages with the remote control. It comes with pre-loaded animations. Plus the PC series comes with amazing effects that will shed light on your business from day to night. Many INDOOR and OUTDOOR models to choose from.